Following an extremely busy art show season and struggling with the limitations of my current Web site, I have decided to switch Web platforms to better serve my growing tribe of patrons, collectors and supporters. What does this mean for you? If you currently follow my blog at http://www.jorn.com and want to continue doing so, you will need to journey with me to my new web platform. The domain name (www.jorn.com) will actually remain the same, but you will no longer receive updates from the previous platform (WordPress) once this switch is made and will need to re-follow me on the new platform to ensure you continue to receive my communications. The transition will happen in about a week and I am sharing this with you all now to ensure no viking is left behind. I will post here again once the site and the blog have landed in their new home and share with you all the exciting new features that will be available. June ended on a wonderful note when the Fountain Square Art Festival honored me with the first place award for “Best in 3D Mixed Media & Sculpture.” This was my first show in Chicago as a sculptor and it was great fun to spend some time in my favorite city again. Since returning home, I have been hard at work preparing for my most ambitious month yet – four shows in four weeks. Apart from all the production, I will also be unveiling a new piece at one of the shows. I hope to see you at one of these shows. With such a good start to my year, I want to thank all those who follow me and collect my work – both in the USA and around the world – with a rare promotion. For the entire month of June, all domestic orders (of $150 or more) will ship for free to anyone who follows my studio online. International clients will receive an instant $25 shipping reduction at checkout. Regardless of how you choose to engage with my work – whether through my blog or on Twitter, Facebook, YouTube or ETSY – your support and patronage is what allows me to continue sculpting and I sincerely appreciate your support. A year and a half ago, I created Odin’s Raven’s: Hugin & Munin. I greatly enjoyed working with a pairing of mythological creatures who were not only significant to the time and culture that created them but who’s wisdom still rings true today. So I’ve decided to follow it up with another powerful duo from Norse mythology, the Wolves of Ragnarok: Skoll and Hati. Just as Odin’s Ravens are a symbol of curiosity, awareness and the thirst for knowledge, The Wolves of Ragnarok are a symbol of endings, reminding us to live life while we can. Wolves appear in many mythologies but nowhere are they more central than in the ancient Scandinavian tradition and few events in Norse myth are as central as Ragnarok. It is the end of the world (literally “Twilight of the Gods”) and several wolves play key roles in the story. So, who are Skoll and Hati? Skoll and Hati are massive wolves who run through the heavens chasing the sun and moon. When Ragnarok is upon the world, they will catch their prey and swallow them whole, marking the end of the world we know and paving the way for a new world to begin. However, this sobering image is not as bleak as it appears at first glance. Consider that the Norse gods know Ragnarok is inevitable – it will come no matter what they do – and when it comes, they too will cease to exist, pulled back into the chaotic void of Ganungagap from whence our universe was created and to which it must return. Yet they do not allow this fact to stop them from working hard to delay it, building up their world, finding joy, love, honor and adventure, engaging in everything life has to offer. In this sense, the symbol of Skoll and Hati as harbingers of unavoidable doom stand as a reminder that all things end and that we should use every moment we have on earth to the fullest. This layered relief is created from four separate castings using cold-cast nickel silver, brass, copper and stone. Patinas, stains, inks and/or paints are applied and the individual pieces are buffed to bring out highlights. They are then assembled, clear coated and mounted in a black, glassless shadowbox. Wolves of Ragnarok: Skoll and Hati is limited to 150 signed and numbered pieces and is available here. I am also reserving a small number of matched sets that will include Odin’s Ravens and Wolves of Ragnarok with matching edition numbers. Who chases the bright bride of the sky. It is worth noting that “Hróðvitnir” (loosely translated as “Famous Wolf”) refers to Fenrir, Loki’s son. Fenrir is the enormous wolf who himself will be the death of Odin at the time of Ragnarok. It is therefore Hróðvitnir’s (Fenrir’s) children (Skoll and Hati) who will swallow the sun and moon. There is some dispute among academics as to which of these celestial wolves chases the sun and which the moon, and there is an interesting article on this dispute to be found here. So, take the message of Skoll and Hati to heart and seize life while you can. Yes, it’s true, and I am not alone in bringing this murder about. In fact, there were dozens of us who contributed to it and, since no body will ever be found, I feel safe in admitting my involvement publicly on this blog. What’s more, I am inviting everyone who reads this post to witness the murder for themselves. It is taking place in Indiana – Terre Haute to be more precise – and it all begins tonight. Tonight, the Arts Illiana Gallery is unveiling The Crow Show, a juried exhibition running Feb 5 through April 22, featuring crow-themed work from artists in Michigan, Ohio, Indiana and Illinois. And, as we all know, a group of crows is referred to as a murder. I was invited to have my “Odin’s Ravens: Hugin & Munin” relief in the exhibition and am delighted to have them in the collection especially as I am only a couple weeks away from releasing the second piece in this series. They (and all the other work on display at The Crow Show) will be available for sale throughout the 3-month event. Now, I know someone is bound to write in and say, “but, Aric, Odin had ravens, not crows,” so allow me to set the record straight. The term “crow” is used for an entire family of birds (Corvidae) that includes the raven species. To put it simply, all ravens are crows but not all crows are ravens, making The Crow Show a perfect place for Hugin and Munin to roost. So, if over the next three months, you find yourself in a drivable distance from Terre Haute and have a free afternoon, I encourage you to stop by what promises to be a very unique exhibition of dark avian art and witness the murder for yourself. I hope you will forgive me for getting my geek on as I am about to do. Although I rarely discuss my early influences, I find on this particular occasion, an irresistible force compels me to do so. In 1977, I saw Star Wars on the big screen and my eyes were immediately adjusted to what storytelling could be. I was eight years old and knew at that moment I would be an artist and a storyteller. Up to that point, my imaginary worlds were mainly inhabited by dinosaurs, army men and matchbox cars – fueled by reruns of Lost in Space, the original Star Trek and Godzilla movies on Saturday afternoons. While these certainly offered fuel enough for my overactive imagination to work with, Star Wars gave me blasters, light sabers, an evil empire with incredibly cool costumes, aliens, dogfighting starships hurdling through a galaxy far, far away and … the force. All these things were revealed through a story that seemed vast, deeply satisfying, strange and yet somehow familiar. I was obsessed with the universe that Lucas had created and wished I could live there in the way many people now wish to live on Pandora (the world of James Cameron’s Avatar). I collected the action figures and dressed up as Darth Vader for Halloween (that’s me, dueling with my friend, Cassie, who obligingly agreed to go as Princess Leia.) Being an industrial designer, my father made the costume with which I won a city wide contest, complete with prize money and a photo op with the mayor that ran in our local newspaper. The lights of the chest plate blinked, the dome of the helmet was sculpted from Bondo with about 20 coats of auto-grade glossy black paint … it was truly awesome. Like so many artists of my generation, I credit the experience of seeing Star Wars for the first time with jolting me awake, opening my imagination in the same way a stick of dynamite would open a pop can – mind blown. Since that day, the Star Wars universe has offered me a wellspring of inspiration – but it did more than that. Wishing to understand how Lucas came up with his world and the story that so engaged me, I began looking into the things that inspired him, hoping one day that this would lead me to create a world of my own. I learned that he was drawing on two of his personal interests – history (especially World War II) and the works of Joseph Campbell (professor and author of many books on the comparative study of world religions/mythology including Hero With A Thousand Faces and The Power of Myth). This got me interested in these areas and lead me ultimately to the historical, cultural and myth-based art I create today. The prequels came out when I was an adult and like most who grew up with the original trilogy, this return to Star Wars left me disappointed. I hated several of the characters (like Jar Jar), plot points (midi-chlorians) as well as the over-use (and in some cases oddly ineffectual use) of CGI. I also found the humor in these new scripts agonizing. Consequently, I wrote these new films off as “written for children” and wondered if my adult mind was simply immune to the magic of future Star Wars films. This never really rang true however and I hoped one day there might be something new worth celebrating in the Star Wars universe that could make me feel the same exhilaration I had felt as a child. So, when I heard that Lucas sold Lucasfilm to Disney, I had intensely mixed emotions. I felt betrayed by Lucas who started out as a rebel director fighting the evil empire that was the American film industry only to forge his own empire – now ultimately to sell that empire to an even larger one. Simply put, he had started out as Luke and was now Darth Vader. Facebook memes showing Leia Organa as “the next Disney princess” made my stomach turn. On the other hand, I felt cautiously optimistic that Disney would find a way back to the original Star Wars universe I loved. Successfully avoiding all spoilers (I only allowed myself to watch the official trailers), I walked into the IMax 3D theater with my wife and daughter a few days after Christmas without a clue what to expect. So, what is my reaction to seeing The Force Awakens? I want to call director, J.J. Abrams, and the producers at Disney/Lucasfilm and thank them for breathing new life into the muse I have drawn on for as long as I can remember. It is good to see Star Wars alive and well again after its long hibernation and I look forward to many more films exploring the far reaches of that galaxy far, far away. Jivotica Story Cards have arrived! Story cards have arrived fresh from the printer for Odin’s Ravens and Viking Prow:Coiled Serpent, as well as for the Ratatosk and Fishing for Jormungand triptychs. I am in the process of sending these out to all those who made purchases this summer. Although I have a fairly comprehensive list, I’m certain there are some patrons who did not add their contact information to my list at the time of purchase. So, if you are reading this and find yourself lacking a properly signed COA/story card to go along with your piece, please contact me and I’ll dispatch one right away – be sure to include the edition number on the piece (if applicable) along with your mailing address. 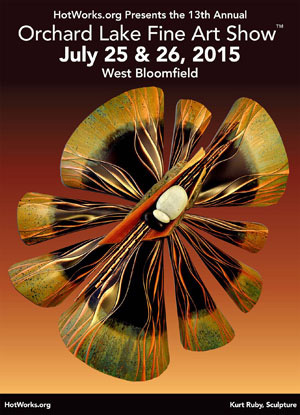 I have three pairs of VIP passes for the Orchard Lake Fine Art Show in West Bloomfield this weekend. If you follow this blog at Jivotica.com or through my FB page and will be in Michigan this weekend, let me know and I’ll send you a pair of tickets. Admission is only $5 normally but, hey, free is still better, right? If you’re interested, please message me through this post by tomorrow (Wednesday) night and I’ll be sure you have them by the weekend. You can find me at BOOTH #108 on the South end of Daly street near the patron parking at Beaumont Medical Center and the Barnes and Noble. I’ll have Norse- and Celtic- inspired art including my new Triptic Tile series, the Viking Prow along with work inspired by other traditions around the world. Thank you to everyone who came to my spring shows. Whether you bought one of my pieces or simply stopped in to chat, it was a pleasure sharing my art with so many visitors and meeting several of my online customers in person. I think that is the real magic of an art show – the chance to speak directly to the artists and they with their patrons. Despite a few bouts of poor weather, the spring shows were wonderful. It was exciting to break in my new tent at Art Birmingham and the East Lansing Art Festival and I was delighted to be invited to share the story behind my work with Fox 2’s Robin Murdock, the Dearborn Press & Guide, and WKAR. Perhaps the most exciting thing took place at Art on the Grand in Farmington where I was awarded “Best in Show.” There were so many talented artists in attendance, the honor came as a surprise. 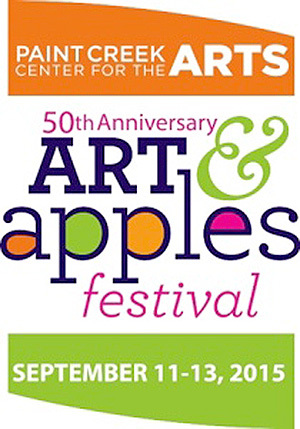 I kick off the summer season with a big one, the Ann Arbor Summer Art Fair. With more than 500,000 people attending each year, this four-day show is by far the largest around and I am very excited to participate in this event as a member of The Guild of Artists and Artisans. I can be found on Liberty just East of Main in BOOTH #258. 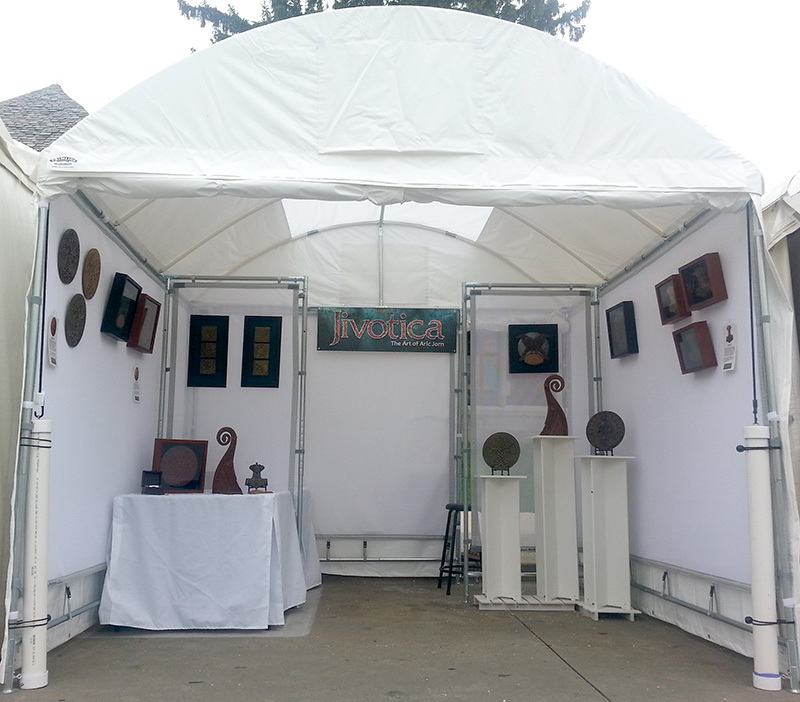 Less than a week after striking my tent in A2, I’ll be setting up shop in the heart of West Bloomfield, MI, for the Orchard Lake Fine Art Show. This show has ranked in the top 100 shows in the nation for eight straight years with a strong emphasis on artistic quality and originality. I can be found on Daly road near the parking lot for Beaumont Medical Center in BOOTH #108. The fair itself can be found just West of Orchard Lake rd between 14 mile and Maple roads. Thank you once again to everyone who stopped by my booth this spring – both for your interest and your support. This has been quite an adventure and I hope to see many of you again this summer.